Creek View is a small collection of 17 ultra-luxe townhouse residences. Originally developed by The United Group, townhomes for sale at Creek View at Lenox feature highly upgraded, energy-efficient interior finishes and a private gated setting that also provides an added layer of security and exclusivity. When first built, Creek View at Lenox Road townhomes for sale initially started at $879,900, while unit layouts typically included three bedrooms, three bathrooms, and right around 3,000 square feet of total living area. Creek View at Lenox townhouses also offer a roomy, open concept layout, and did we mention there’s also a private elevator inside each residence that goes to each of the main living levels and garage below? With too many luxury finishes to list, townhouses at Creek View at Lenox truly are must-see. 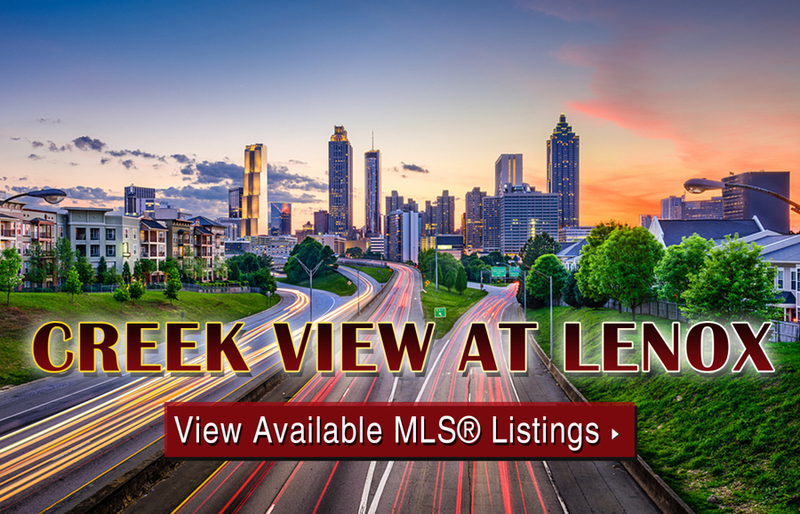 If you’d like more information about Creek View at Lenox townhomes for sale in Atlanta, call us today at (404) 564-7272, or click below to start browsing active listings at this amazing residential community. Listed below are recently closed sales at Creek View at Lenox Townhomes. Whether you’re thinking about buying or selling a unit at the Creek View at Lenox Townhomes, checking to see what other comparable properties have sold for in recent weeks and months provides helpful insight into current market conditions for the community. For more information about Creek View at Lenox Townhomes for sale or for a complete list of recent townhomes sold in the neighborhood, contact The Zac Team today! Sitting right next door to the Overlook at Lenox community, Creek View at Lenox is just the latest residential development to hit this part of Lenox Road NE. Situated just up the street is the upscale Lenox Square shopping mall, which means you’re just minutes from a movie theater and all sorts of top notch restaurants and luxury shopping outlets. Interstate 85 is also located nearby, which means residents at Creek View at Lenox are also never too far from all the big city amenities and attractions that all of Atlanta have to offer as well! Can’t find what you’re looking for at Creek View at Lenox? Start browsing other Buckhead real estate for sale or give the Zac Team a call at 404.564.7272 for help with your new home or condo search today!